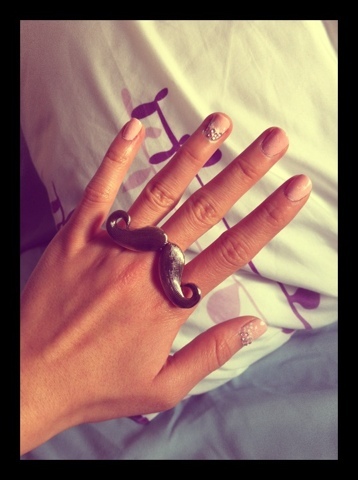 DIY nail design beauty blog. Accidentally had a door slam on my hand at work a couple months ago. The bad nail is growing out and a new one is trying to come it. It's all just very gross. So I have a wiggly damaged nail waiting to grow out and fall off. Until that moment comes, I can't really do much with it but put a band-aid over it to hide the ugly. I guess I can try to use my left hand to paint on my right... I'm just not very ambidextrous. Another simple look for your nails. 1. Paint a base coat and then a silver polish. Even though you won't see most of the silver in the end, keep it even or else, the next coat will look uneven. 2. Start with your first stroke in the middle of the nail but leave a small gap between the cuticle and where you start. Use your cuticle as a guide to where you should place your brush. I have a little bit of a more square shaped cuticle so I'll have to round off my painting. 3. You should get something like this. It's not even yet because it's your first coat. Once it's settled a little, go over with the 2nd coat. 4. Now you should have this. Go over it with a top coat. As long as I spend the holidays with good company, I don't really mind. Cheers to the snow that never happened! 1. Paint a shimmery/pearly pale blue base. 2. With a small paint brush, paint the first line for the snowflake. 3. You're basically going to make an asterisk (*). One cross should me bigger than the other. 4. Now Start with one of the longer arms and make 2 dashes coming out of it. Continue all around. 5. Now continue making dashes on the smaller arms. 6. Make small X's and dots around the big snowflake. Seal with a top coat. 1. Baby pink to start. 3. While the glitter polish is still wet, apply gems with a toothpick on 1/3 of the nail randomly. 4. Dot around the gems with a white polish and a dotting tool. Top coat to finish. 1. Start with a pearly base colour. I had to use about 3 coats of Plush Platinum. 2. Dab on the side with a green polish. You don't have to be neat. Make sure you get some jagged looking edges. 3. While the green is still wet, use a toothpick to pick up your gems/beads and place them on. Again, you don't have to be neat. Top coat over it all to seal it. 4. To make a tree, you do the same as before but make a triangular shape as opposed to dabbing on the side. I added a yellow gem at the top of the tree. It would look better with a star gem. Peppermint candies remind me of the holiday season. I especially love it when a peppermint candy cane is in my hot chocolate. Here's another simple tutorial (if you have a steady hand). 1. Paint your base coat and then white all over the nail. I painted 2 coats here. 2. Paint a curved line from the center to the side. Then from the same point in the center, draw another curved line but ending it at a different point next the the first line. 3. Colour it in! You should have something like this. 4. Continue on with the rest of the nail. Start from the same point every time. 5. It should end up looking something like this. I did 4 little curved triangles. You can do as many as you'd like, but I stuck with 4 because it was easier to divide evenly. You can add a wash of glitter or just top coat the whole thing. As you can see, I also did some stripes instead of making all my nails peppermint swirls. Hope you can have fun with this too!